Color in Thai is สี /sĭi/. When Thai people talking about color the word สี /sĭi/ can be put in front of the name of the color or can be dropped. The first set of colors I learned when I was a little girl were the colors of a rainbow. The word “เข้ม /kêm/” dark and “อ่อน /òrn/” light is put after the color to describe dark or light shade. For example; สีแดงเข้ม /sĭi daeng kêm/ dark red color. Thanks Mod for the information about colors. I have just read today cos I was looking for how different colors are called in Thailand. 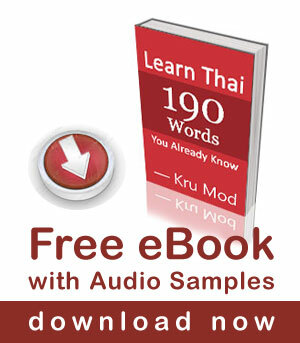 This summer I have promised myself to learn more Thai to upgrade from where I had reached. Thank you for your suggestion. It is a good one! How do I say in thai I want to color my hair blonde? You would say ชั้นอยากทำผมสีบลอนด์ /chán yàak tam pŏm sǐi blon/. do you have a video to listen the correct pronunciation of the different colors? Supergood blog with lots of useful information and details you couldn’t find anywhere else! My first visit here but I’m gonna be a regular! About the colours I’ve heard they also have some deeper meanings. Like for instance if you see a new house and in bright pink it means there’s living a single lady or a purple one if the house belongs to a widow etc. Don’t know if it’s true but as I’ve understood all the colors have some hidden meanings??! Does they and if it would be so nice o learn more about that! Thank you so much Mod for this excellent webpage!! Sawatdee ka Marqar, thank you for reading my post and your interesting comment. I will do more research about it. ฉันชอบสีฟ้า ^^ ขอบคุณมาก for teaching! I’m ฉันลูกครึ่ง but I forgot Thai so I’m learning again. You help me to understand.